It's interesting to learn that in Xinjiang, even though the majority of the population are ethnic minorities like Uygyurs who practice Islam, back in the Tang Dynasty, they followed Buddhism thanks to the teachings of monk Xuanzang. He was from Henan province and was ordained as a novice Buddhist monk at the age of 13, then a full monk seven years later in Sichuan. The monk and scholar became famous in 629AD and on his way to India to learn more about Buddhism, he passed through Qocho kingdom. Its king, Qu Wentai was so interested in the religion he wanted Xuanzang to stay and teach more people about Buddhism. But Xuanzang was insistent on continuing his journey, though he promised to come by on the way back and teach what he had learned. 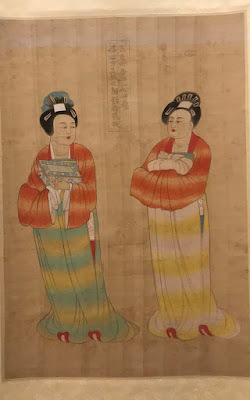 However, by the time Xuanzang returned, the king had already passed away. We visited a now deserted prayer area where he taught Buddhism in Qocho, today known as the Gaochang ruins outside of Turpan, Xinjiang. Another interesting factoid is that Xuanzang recorded his trip in detail in a text called Great Tang Records on the Western Regions that inspired the novel, Journey to the West.